Image from Patent 3,125,189 (March 7, 1964). Source: US Government. On August 15, 1961, Seattle architect John Graham filed patent 3,125,189 for “a restaurant of novel construction, which is to be erected at a considerable elevation on a supporting structure on the top of a building or on a tower built for the purpose.” So the customers could enjoy the view, the dining area was to feature “a rotating annular floor equipped with tables and chairs and having its outer edge lying close to the outer wall.” The result was the Eye of the Needle (later renamed SkyCity), the revolving restaurant at the top of the Space Needle. During the 1962 World’s Fair, twenty thousand visitors a day waited more than two hours for a chance to eat in the restaurant. Even Elvis ate there in It Happened at the World’s Fair. The world’s first revolving restaurant had been unveiled three years earlier, at the Florianturm in Dortmund, Germany. La Ronde followed later that year at the Ala Moana Center in Honolulu, then the nation’s largest shopping mall. By 1961, a revolving restaurant crowned the Tower of Cairo, long the tallest building in Africa, and the Henniger Turm, the grain silo of the Henninger brewery in Frankfurt. 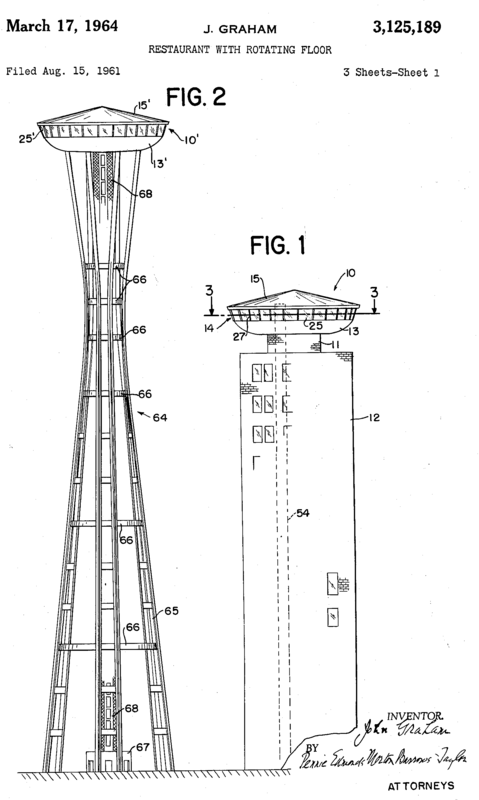 The German towers proved a rotating, high-altitude tourist restaurant could be successful, and the Space Needle introduced the concept to the world. 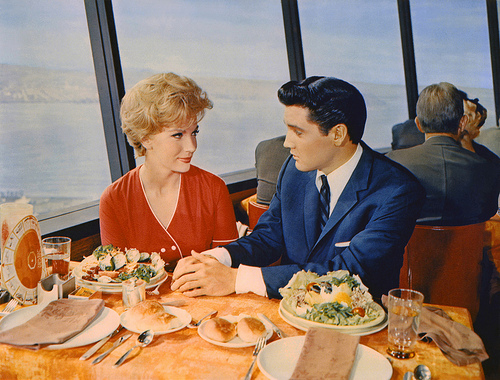 Elvis and date atop the Space Needle. Source: ourseattle/Tumblr. In the decades following the 1962 World’s Fair, revolving restaurants sprouted up across the globe. At least 65 countries and 29 states would eventually boast one or more. They topped hotels, television towers, and even Swiss Alps. Bond-villain Ernst Blofeld had his secret mountaintop laboratory in the revolving restaurant at Saas-Fee, Switzerland, the highest in the world at 11,000 feet. Reykjavik’s revolving restaurant sits atop old hot water storage tanks beside a geyser. And in Pyongyang, the original plans of the 105-story Ryugyong Hotel, still unfinished after 27 years, called for five of them. But these restaurants weren’t the first structures to rotate. As documented in Revolving Architecture: A History of Buildings that Rotate, Swivel, and Pivot, dreamers had been drawing up plans for rotating houses and parking garages and solariums for decades before the Florianturm was built. In all these structures, the rotation served practical purposes: patients could be moved between rooms more easily, cars could enter and exit garages in gear. Humans had also rotated for pleasure. By the end of the nineteenth century, rotating observation towers cropped up in British coastal resorts. In 1911, The Advance magazine reported “[a] concrete pier, which is being constructed at Santa Monica, Cal., will have a genuine novelty in a revolving restaurant. The second story of the building will revolve slowly, and the people who eat there will have a constantly changing view.” A few decades later, rotating bars began to appear: the Morrison Hotel bar in Chicago, the Chez Ami in Buffalo, and, most famous among them, the Carousel Piano Bar at the Hotel Monteleone in New Orleans, haunt of Tennessee Williams and birthplace of the Vieux Carré cocktail. World’s Fairs have always been incubators for technological innovation. Alexander Graham Bell debuted the telephone at the 1876 Centennial Exposition in Philadelphia. The Ferris Wheel first ran at the 1889 World’s Fair in Paris. The electrical outlet had its premiere at the 1904 Louisiana Purchase Exposition in St. Louis. And in 1933, Norman Bel Geddes, of Futurama fame, designed an intricate, multilevel revolving restaurant complex that would spin on a central column and afford diners sweeping views of the fairgrounds of the Century of Progress International Exposition in Chicago. But it was never built. Instead, it was the futuristic Floriansturm and Space Needle – built for a horticultural fair and a World’s Fair, respectively – that eventually joined views and dining, adding a dose of Space Age elegance along the way. Diners could now ascend high-speed elevators to luxury UFOs cropping up in major world cities, where they could sip Manhattans and dine off mood-lit white tablecloths as the lights of the city passed by like stars. Even if the view nearly always beat the food and drink. Though it’s called a revolving restaurant, it’s not the restaurant itself that rotates. Instead, diners are seated on a (usually) doughnut-shaped turntable surrounding a stationary center housing elevators and service areas. This arrangement required new ways of serving food. Video from the early 1960s (above) shows a dress rehearsal in preparation for the opening of the restaurant atop the BT Tower in London. CN Tower, Toronto, from Dundas Street. But to everything, there is a season (turn! turn! turn!). The revolving restaurant’s popularity has waned considerably in the United States and Canada in recent decades: the last one built was the Stratosphere nearly 20 years ago, and many have stopped rotating or closed altogether. This is perhaps related to popular food culture’s increased emphasis on authenticity, creativity, and technique over opulence and experience. 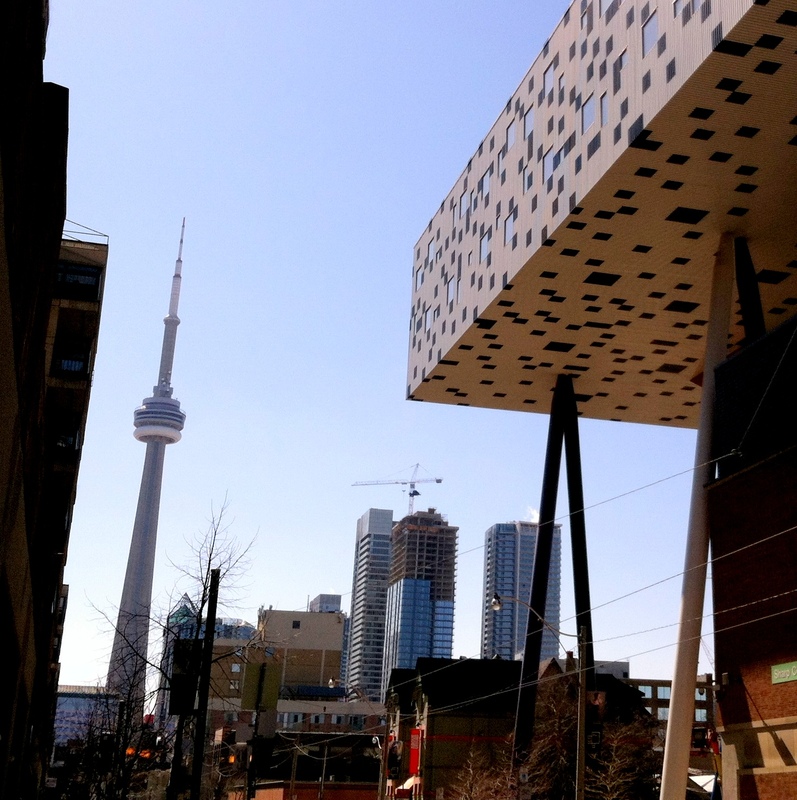 The idea of rotating in the sky while you eat steak and sip champagne seems kitsch now, even a bit campy – a quaintly retro vision of what a nice night on the town should entail – even if the CN Tower and the Stratosphere continue to pack them in. But the concept has remained popular elsewhere, with revolving restaurants continuing to pop up in the Middle East and Asia, for example at the Canton Tower in Guangzhou. Will revolving restaurants make a comeback in the United States and Canada? What’s old is always new again, and, when it comes to the revolving restaurant, maybe someday we’ll see a second revolution. I went there in 2013. You definitely pay for the experience. I didn’t think about the people who might have sat in my same spot, but after seeing that picture of Elvis I might pretend that I sat in his spot lol. Is this the one that a child died in, or is that just in a book I read? Sometimes my book-life and real-life get mixed up. I have that same problem! The other day, I asked my friend if she ever figured “something” out. It took us talking for a bit for me to realize I was thinking of a “friend” in a boom I was reading and not my actual friend 🤦🏼‍♀️ haha As for the child you refer to-I’m not sure about that. Wow! An astonishing amount of detail. I never gave the subject much thought, but you have made it fascinating. Kudos for great research and great writing. I tried eating in one of these once in a restaurant back in Sydney a couple years back. I’d say the concept of this is utterly amazing, and that it topped the experience of the customers eating there! What was better was, I ended up slurping my spaghetti, whilst really enjoying the rotating view up close by the window seat. 😉 Insightful article! Very cool! Thanks for sharing about the turning restaurants…I found it very interesting. I think my three boys will too, so I am going to show it to them. We may have some road trips to go on! I found you need to be careful where you put your bag down – I put mine on the windowsill at the restaurant in the Telstra Tower in Canberra, Australia, and eventually realized I had rotated five tables away from it. The movement was slow enough that I hadn’t understood until then that the floor was moving, but not the walls. Brings back memories of my grandmother taking me up there so long ago. When you are in a revolving restaurant, does the view change? I ate at one of these in New York City many years ago. I believe it was on Park Avenue. Upscale which meant the food had names I could not pronounce. Wow! We had the privilege of eating on top of the Space Needle when we lived in Seattle. It is a cool experience! Now, we live in Honolulu, HI. So, it was fun to see our mall mentioned here too! I’ll have to research it some more! I didn’t know about a revolving restaurant there. I know we have one in Waikiki! ← What Food Movie Are You Craving Tonight?